We grew up in the ’80s, which means at some point our parents put ugly Christmas sweaters on us, took us to the mall and made us pose in front of a man who shouldn’t have been within 500 yards of children. 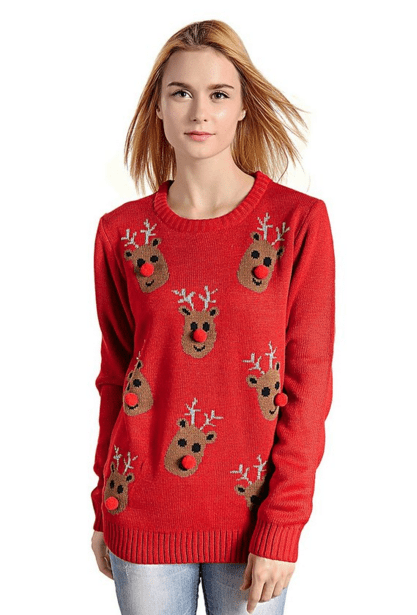 But those days are gone, and now Christmas sweaters are part of the over-the-top intentional irony that has come to plague much of modern life. Just kidding. 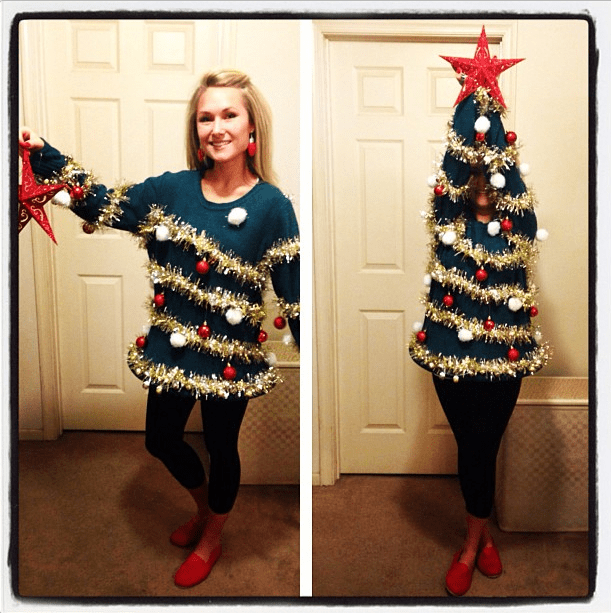 Whether you’re attending an ugly Christmas party, or just want to embarrass your friends and family, here are a few ugly Christmas sweater ideas you can put to good use this holiday season. Usually, it’s a good idea to have your Christmas sweater match the shape of your body. 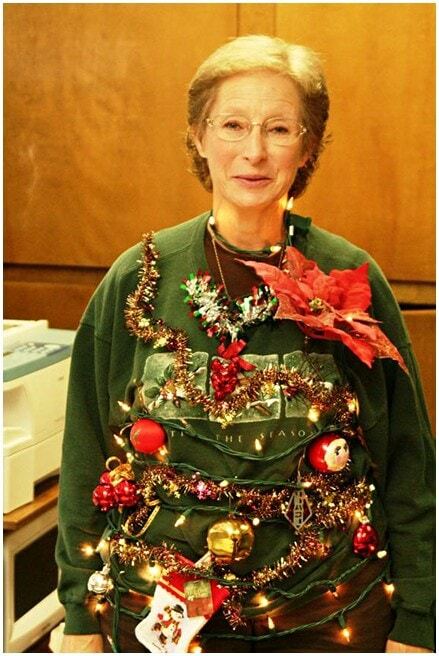 This woman, who we’d like to think is named Nancy, did a wonderful job of creating a Christmas-tree like effect and topping it off with a poinsettia. That last one is also a good life mantra in general. The ugly Christmas sweaters that seem to get the most attention are those with strong centerpieces, like this bearded Santa. Your eye is naturally drawn to the piece, and it takes a lot of effort to look anywhere else. That’s the sort of thing you want to happen when you put on your sweater. 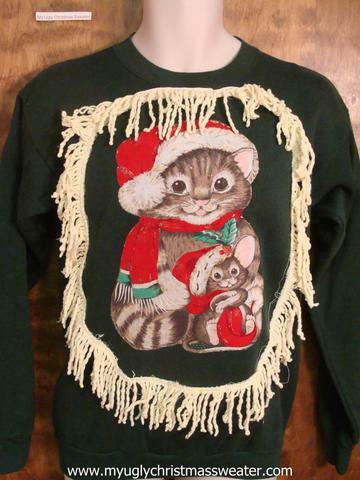 We couldn’t find the source, but somewhere in the Bible there is a mention of how closely cats and Christmas sweaters are related. We don’t like to bring religion into things, but we’re already talking about Christmas, so we’re dead in the water. 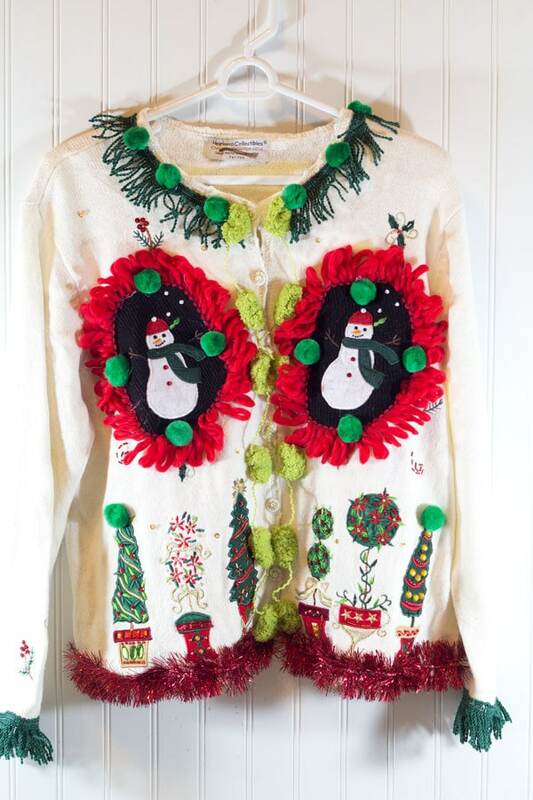 This Christmas sweater also proves that fringe can go a long way in framing your sweater centerpiece. If this was just a cat, it would be really cute. But now it’s cute and over the top and we love it. For those who want their Christmas sweaters to be south of the border, check out these sweater pants from west knits. 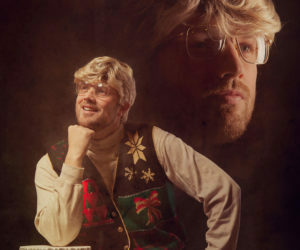 They offer a great step-by-step tutorial on how to turn an old ugly sweater into great pants, perfect for dancing and photography, as you can see by their page. The key to Christmas sweater ugliness is finding the right stuff to pin/glue/sew/otherwise attach to the blank canvas that is your sweater. 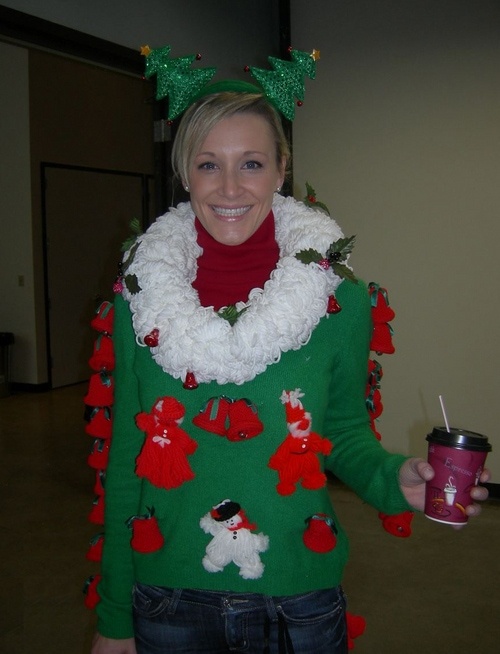 Here, you can see that with some garland or other long material, you can make some real neat patterns that will make your sweater stand out in the crowd. Just remember what people say about horizontal stripes. 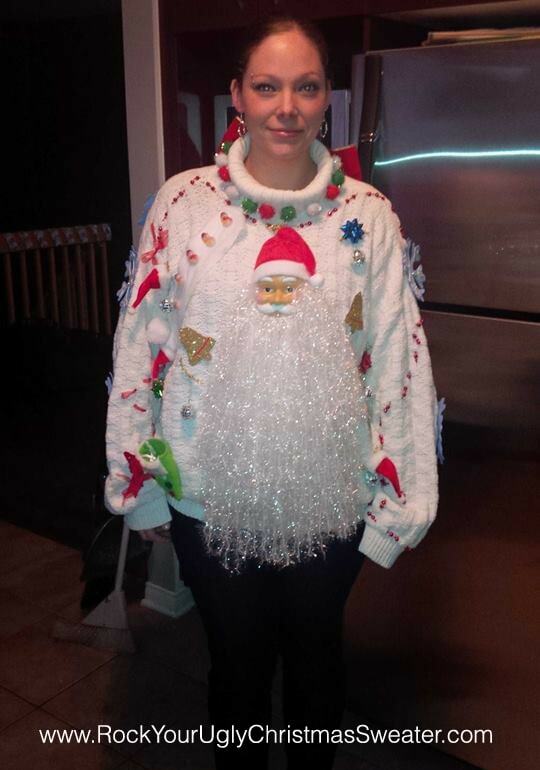 A Christmas sweater with lights is like saying, no one one-ups me, I’m the one that does the one-upping. 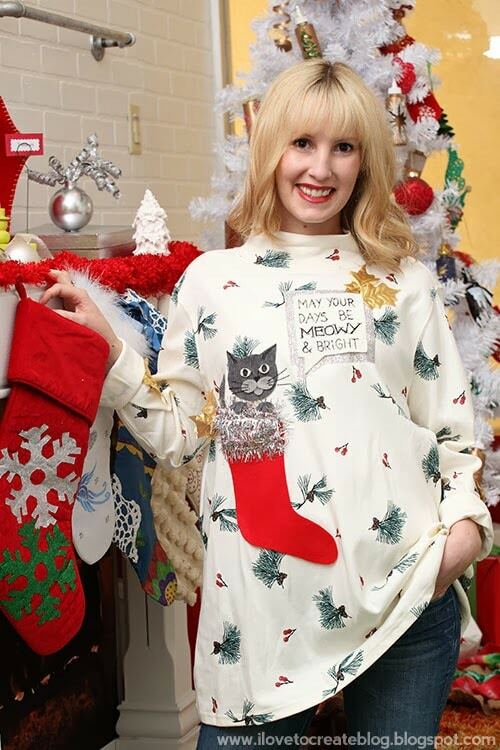 Such is the attitude one must have in order to sport a cat-and-light Christmas sweater. It’s a bold move, but if you’re willing to go there, more power to you. We could make this section sexual, but this is a family-friendly blog and so we’ll just leave it at this: sometimes the best sweaters have the biggest things hanging off them. 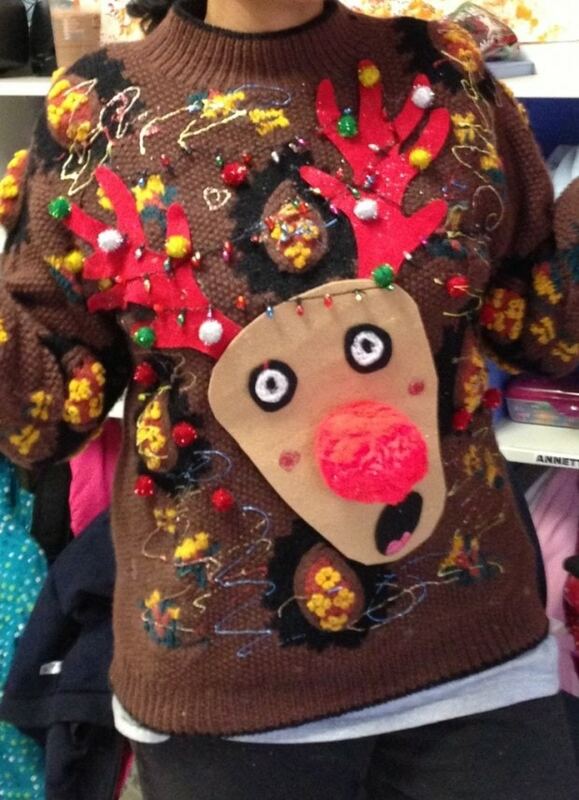 Please remember that the line between funny and Freudian is often blurred, so create your sweater accordingly. If you have a friend or family member with the same affinity for Christmas ugliness as you, consider a two-piece combination. 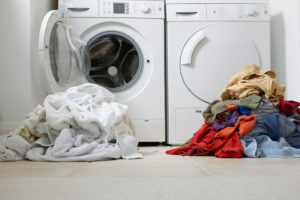 You’ll have to be with said friend or family member the entire time you wear the sweaters, however, which makes going to the bathroom either fun or awkward, depending on your lifestyle. These three look like the young nieces of Mrs. Clause, if those nieces ended up getting 9-to-5 desk jobs that didn’t pay well because this was the “stage” of the economy where there were more overqualified candidates than normal, so the company in this scenario could afford to hire younger folks that would settle for less money, but in the end, they (the nieces) showed no commitment to the company and left the first time they got an email from a job recruiter on LinkedIn. Sad but true. There are plenty of ancient myths that deal with people and beings carrying the weight of the world on their shoulders. You don’t have to go that far, but going with a style like this one shows that you can dangle things from your shoulder down and make it look ugly. 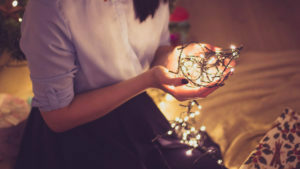 Maybe you’ve combed through your closet and much to your dismay, there is nothing that you can turn into a Christmas sweater. Have no fear; like the woman above, who wished to remain faceless, you can turn any old dress or garment into something Christmas-y and ugly simply by hanging stuff on it. End of story. This is helpful, unless you work in a department store and while showing your friends what you can do, a customer walks by and says “oh what a nice tree,” and your manager wants to keep the compliments coming so he or she makes you stay in that pose all day, and by the time your shift is over, your arms have the same consistency as jello and the next morning you feel a lot better about your prospects for losing weight when the holidays are over. People put all sorts of emotional and physical baggage on their children, so why should it stop around the holidays? 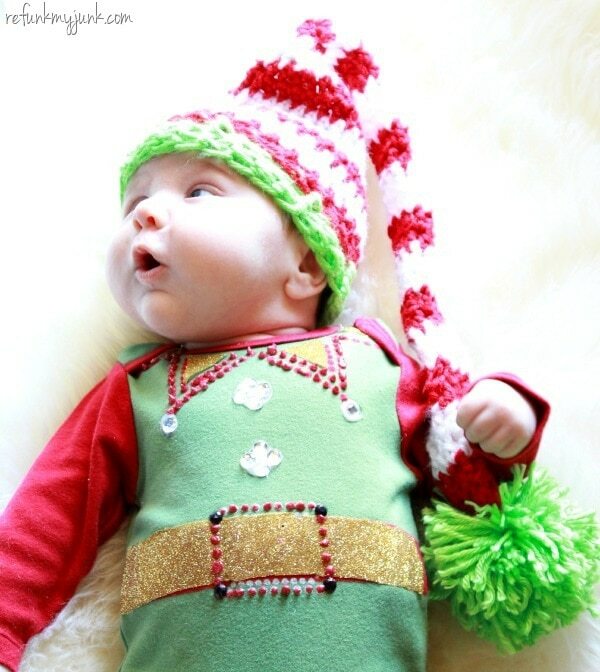 Dress your child up in something hideous this Christmas and then make them go somewhere like the mall, or the park, and tell them that every time they see another kid, they have to explain why they’re wearing that particular sweater. They’ll love it. 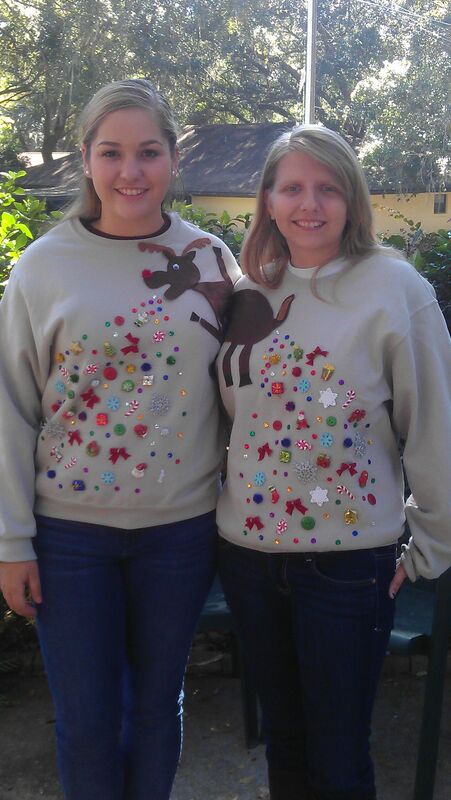 Headpieces like the one above can be a great way to extend the theme of your Christmas sweater. Just remember that the added weight of something on your head can potentially affect how fast your body metabolizes alcohol, or so we’ve heard. 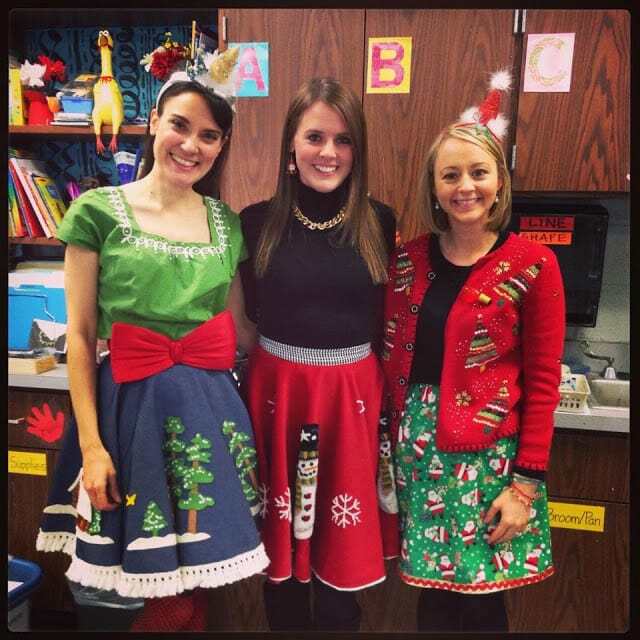 If you just can’t pull off an ugly sweater, consider making a cute skirt using a cute skirt. 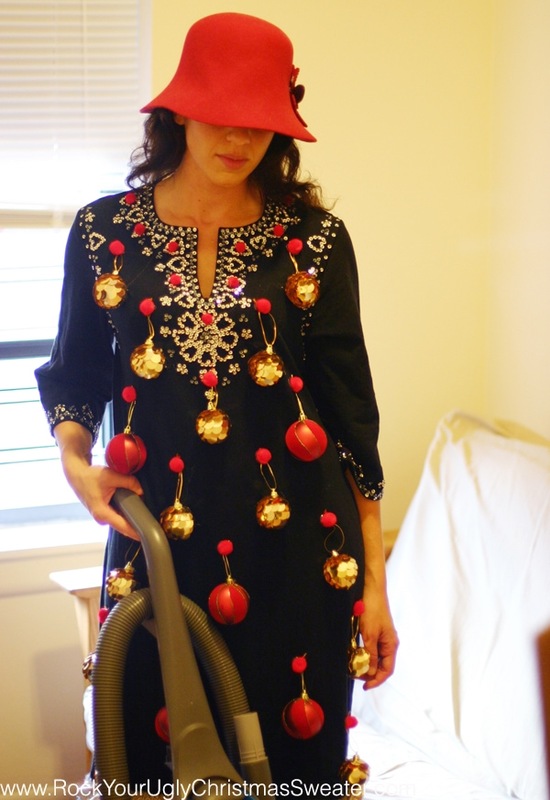 Tree skirt, that is. And when people compare you to a tree, you’ll have to ask what kind of tree they’re talking about before considering it a compliment or an insult. Back in fifth grade, I had an English teacher who always said “KISS: keep it simple, stupid.” I thought she was stupid, but it turns out she was right. 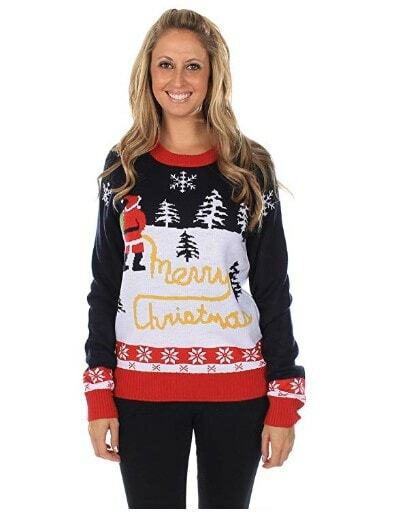 Except when it comes to ugly Christmas sweaters. 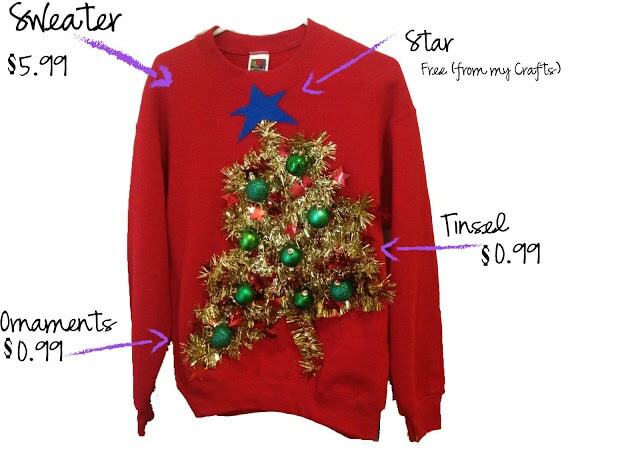 Keeping it simple is keeping it safe, and nothing about ugly Christmas sweaters should be safe. So consider doing what this woman did, and throw as many random things together as possible and call it a day. Men love Christmas ties, or the idea of Christmas ties, or maybe they dislike the idea and the actual thing itself, I can’t really tell. 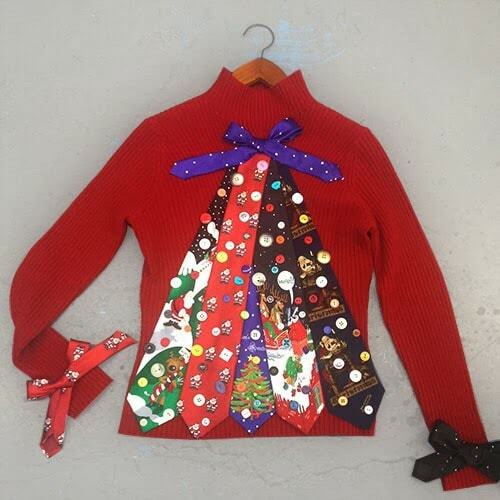 Christmas ties are, for better or worse, part of our culture, so why not do something like this and make them useful. 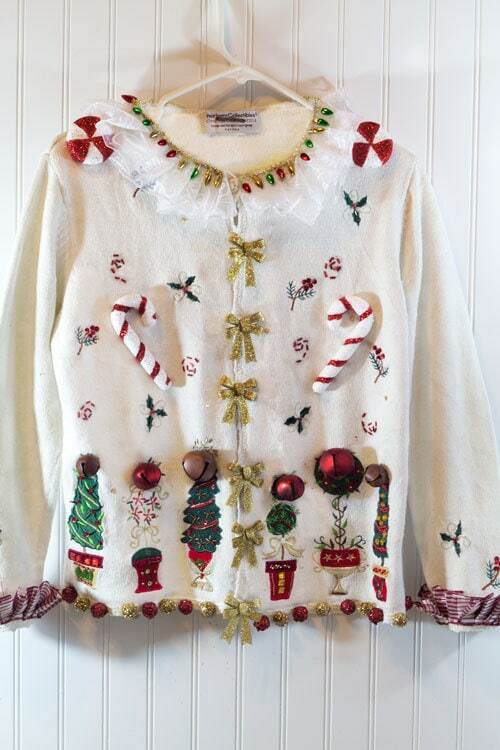 The contrast between light bulbs and shimmery garland makes this sweater a winner in our book. She also has a great smile and so it’s like, c’mon, what a great picture! 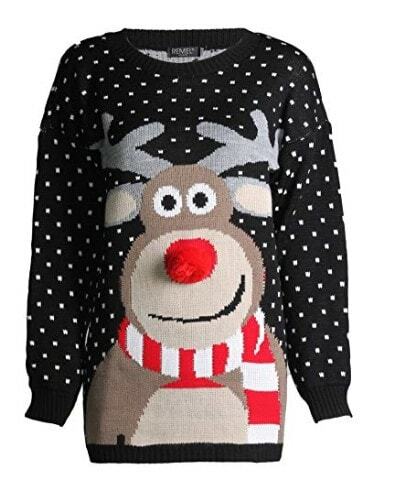 Christmas ugly is all about asymmetrical, weird stuff, but sometimes it’s nice to see things have some order. 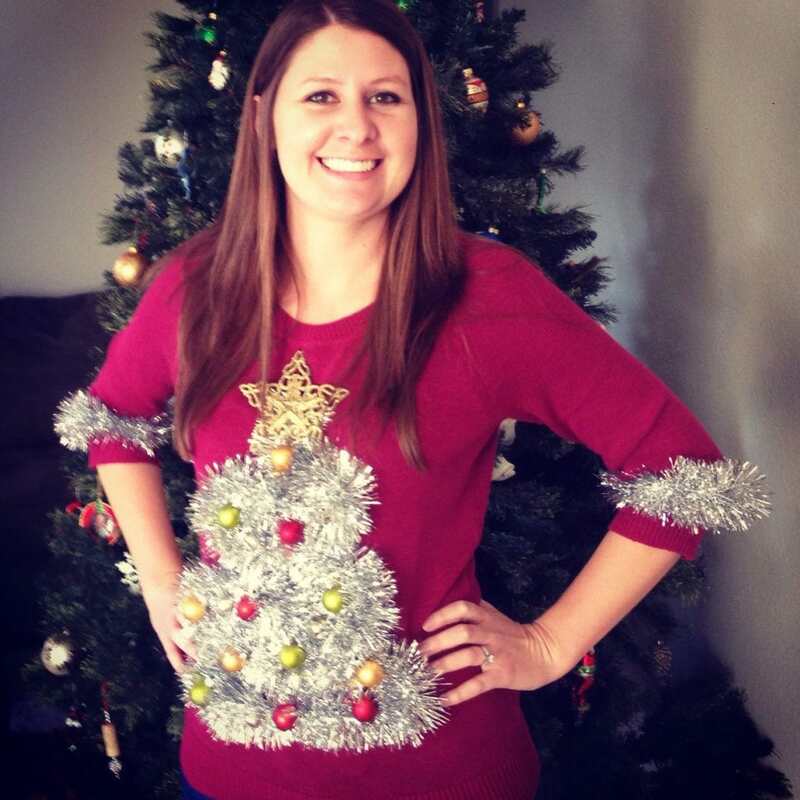 This balanced looking Christmas sweater would be perfect for the person who wants to let loose a little bit, but still keep things neat. 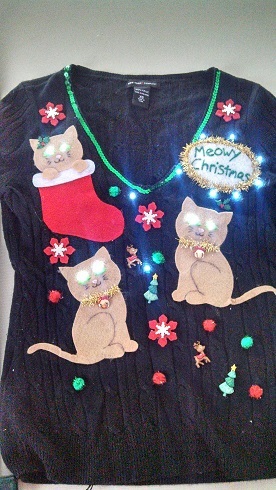 Once again, cats are a great way to decorate your Christmas sweater. If you have cats, you might be able to use actual cat hair for whiskers or something like that. We don’t have cats so we don’t know exactly what you can do. But you can do something. Let’s not forget the sweater’s first cousin, the vest. 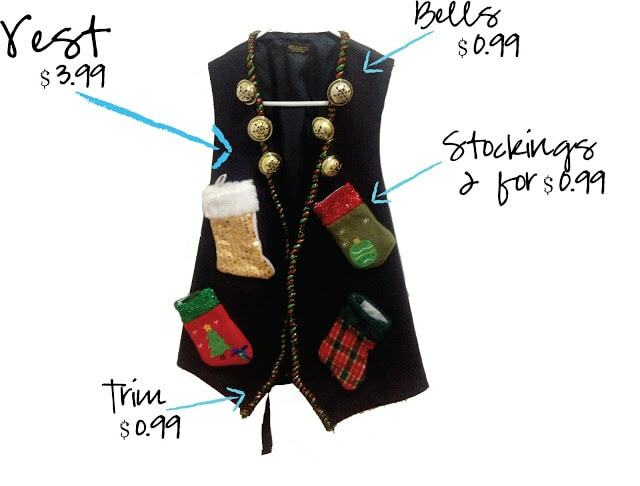 The Christmas vest above was created on “the cheap” but still has all the wholesome ugliness of some of the more expense and refined ugly sweaters. 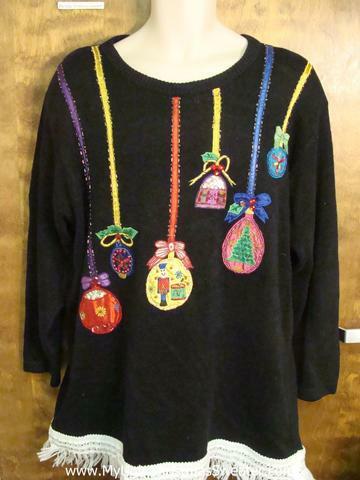 If you’re the understated type who doesn’t like to be on center stage, consider this type of ugly Christmas sweater, which is ugly, sure, but is also tasteful and looks like something our great grandma might wear. Love you great grandma. Great lines, nice curves: this little number has it all. It also looks like something from The Grinch. Even if you’re on a budget, you can still get weird. 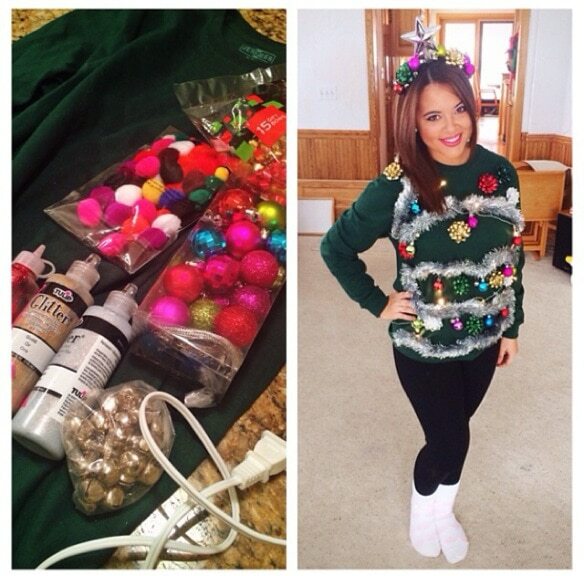 My Thrifty Chic offers a great breakdown of some cheap DIY projects she made for the holidays, and we love this getup. 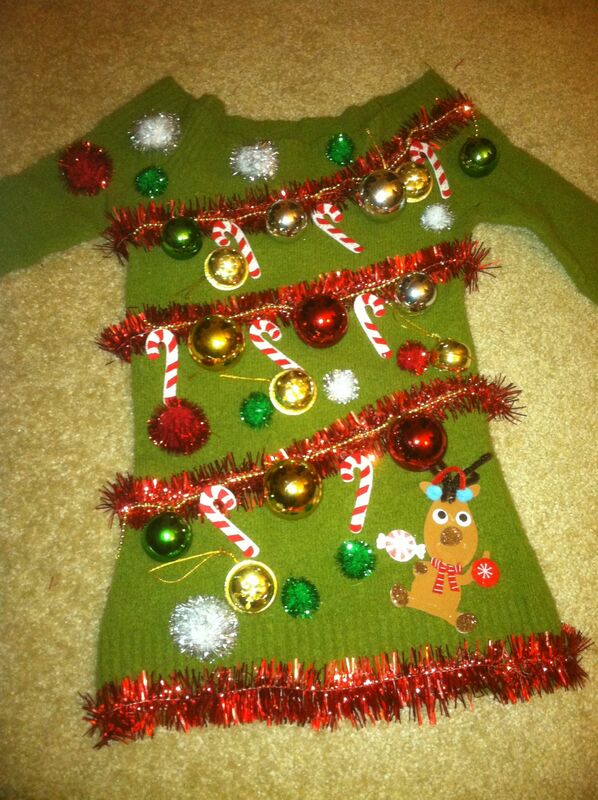 If we were down to our last $10, we’d go to Savers and try to put together something like this. Let’s hope it doesn’t come down to that. So why not make it (him? her?) wear something like this? The baby’s life is in your hands. 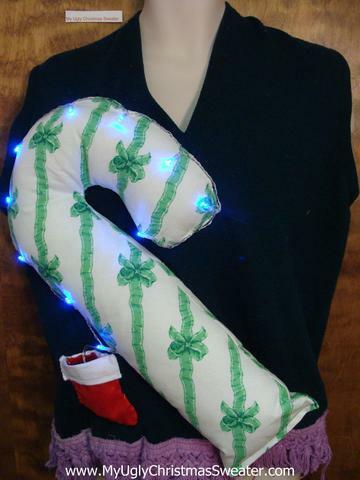 Okay, so there’s something about sweater pillows that seems NSFW and normally it is, but we swear there’s nothing NC-17 about these Christmas pillows. 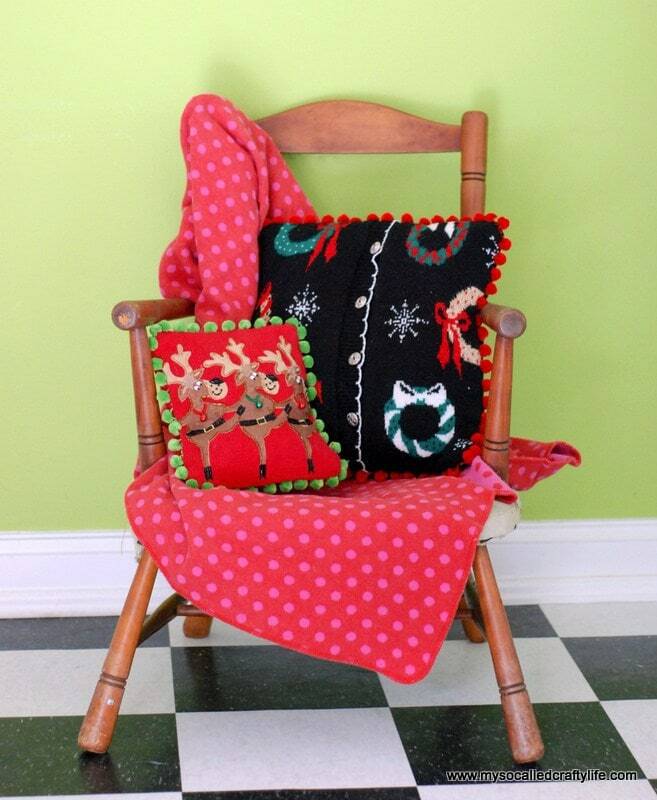 If you’ve gotten your share of sweater-wearing and want to do something a little different, check out this pillow tutorial from my so called crafty life. 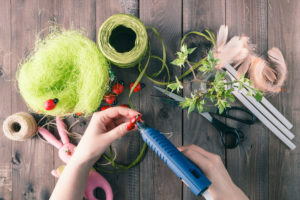 It’ll breathe new life into your old sweaters, and you also get the chance to say “check out these new sweater pillows I’ve got” without referring to cosmetic surgery. 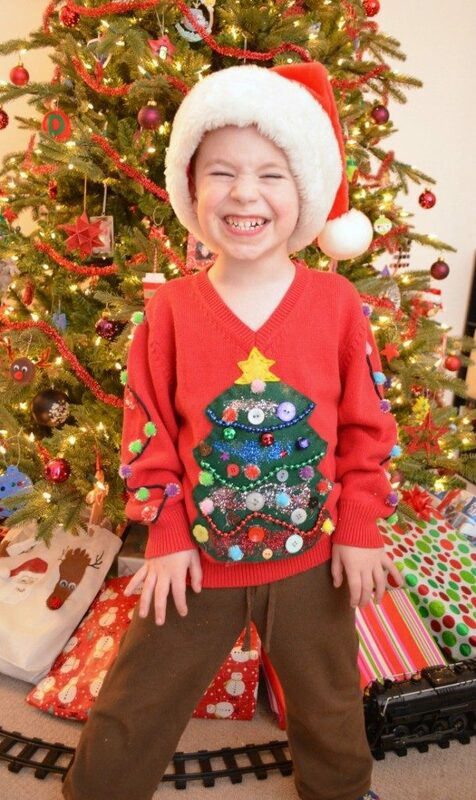 Send us your ugly Christmas sweater pic and we’ll feature it on MostCraft! Look, let’s get real with ourselves for a moment. Sometimes you’re just not good at doing things yourself. In this case, may we present some easy alternatives.